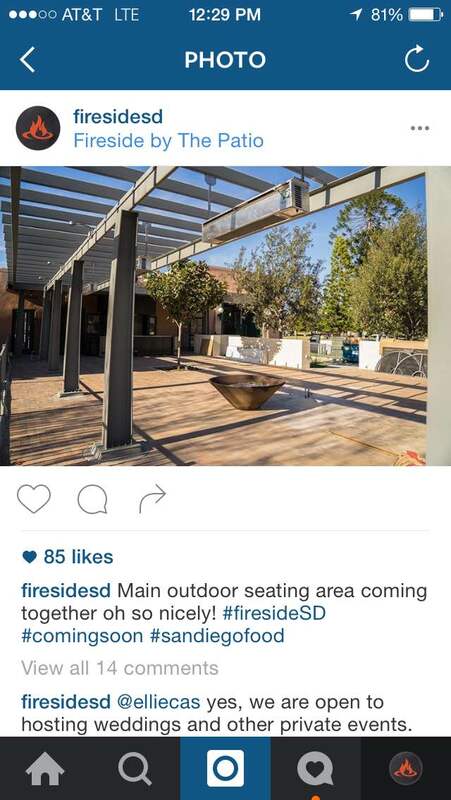 Fireside by the Patio opened to the public on March 9, 2016. Before they served their first plate, they had already received over 600 reservations and earned 3000+ followers on Instagram. The local hype and excitement around this restaurant opening was previously unprecedented for their specific neighborhood (Point Loma, CA). While Fireside had been promoted across multiple channels, social media was heavily leveraged as a cost-effective, real-time way of reaching customers. About 2 months prior to Fireside’s soft opening, Elevated Marketing Group launched a group-focused marketing campaign to target people who live, work and play in the Point Loma area. Our team created Facebook and Yelp advertisements to reach our target audience and included an offer of a complimentary appetizer in exchange for their email address. These emails were then used to re-target these individuals via social media advertising. Over 1000 emails were captured prior to opening. Running parallel to the Facebook and Yelp efforts was a strong Instagram campaign. As mentioned, Fireside had acquired thousands of REAL, LOCAL, and RELEVANT followers prior to opening! Not one of these followers had physically seen the "boho" lounge, tasted the yakitori or smelled the Santa Maria grills, and yet they still followed and engaged. Potential followers were targeted based on their location paired with interests in similar restaurants, craft cocktails and our head chef, Antonio Friscia. Instagram proved an amazing breeding ground for excitement. Followers were consistently asking questions, engaging with our account and trying to get details. We teased followers with food shots, photos of our team and construction updates. To round out our efforts, Elevated created a local influencer program (Read about our influencer programs here) in hopes of bringing some of the area’s top social media personalities to the restaurant. We announced the program on our social platforms and on our website. Potential influencers were asked to apply by providing basic details and their social handles. Those that fit our predetermined criteria were invited to the ongoing program, which launched after the restaurant's soft opening period. Fireside by the Patio is a fantastic example of utilizing social media and an online presence to drum up interest and excitement before the doors opened. Within just two months of operation, Fireside exceeded 7000 followers and continued to see very high levels of likes and engagement. Fireside is also enjoying a high level of user generated content, which get re-posted regularly across all the social media channels.